Egypt is located in northeastern Africa. Egypt is bordered by the Mediterranean Sea and the Red Sea, Libya to the west, Sudan to the south, Israel and the Gaza strip to the east. 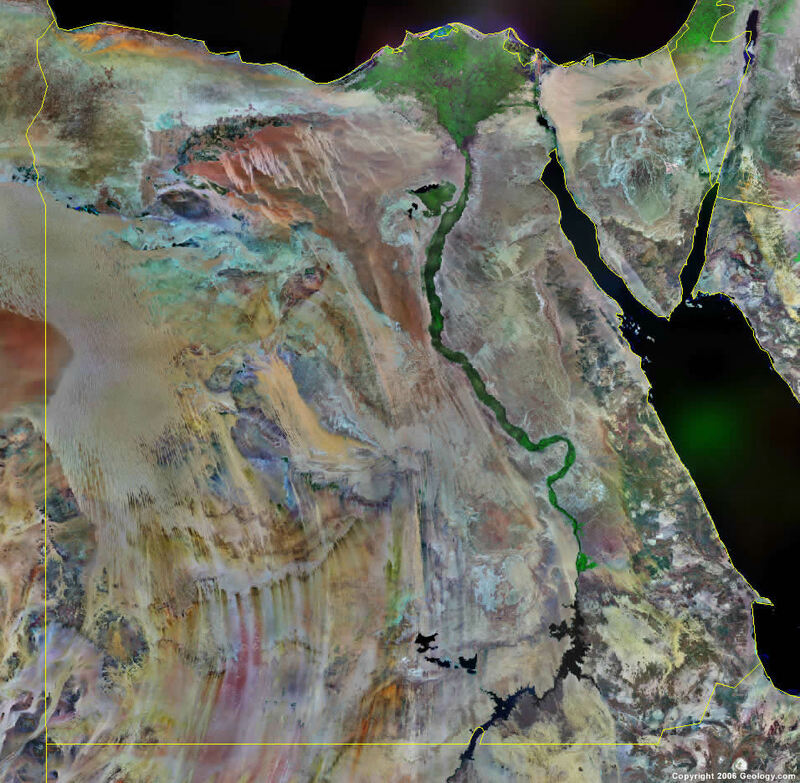 Google Earth is a free program from Google that allows you to explore satellite images showing the cities and landscapes of Egypt and all of Africa in fantastic detail. It works on your desktop computer, tablet, or mobile phone. The images in many areas are detailed enough that you can see houses, vehicles and even people on a city street. Google Earth is free and easy-to-use. Egypt is one of nearly 200 countries illustrated on our Blue Ocean Laminated Map of the World. This map shows a combination of political and physical features. It includes country boundaries, major cities, major mountains in shaded relief, ocean depth in blue color gradient, along with many other features. This is a great map for students, schools, offices and anywhere that a nice map of the world is needed for education, display or decor. 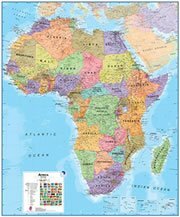 If you are interested in Egypt and the geography of Africa our large laminated map of Africa might be just what you need. It is a large political map of Africa that also shows many of the continent's physical features in color or shaded relief. Major lakes, rivers,cities, roads, country boundaries, coastlines and surrounding islands are all shown on the map. Abu Sunbul, Al 'Arish, Al Bawiti, Al Fayyum, Al Ghardaqah, Al Jizah, Al Kharijah, Al Minya, Al Qusayr, Al Tur, As Sallum, Aswan, Asyut, Baltim, Bani Suwayf, Baranis, Baris, Benha, Beni Suef, Bur Safajah, Bur Said (Port Said), Cairo, Damanhur, Dumyat (Damietta), El Giza, El Iskandariya (Alexandria), El Mahalla el Kubra, El Minya, El Qahira (Cairo), El Suweis (Suez), Elat, Helwan, Idfu, Isma'ilia, Luxor, Marsa al 'Alam, Marsa Matruh, Mut, Qina, Ra's Gharib, Sharm ash Shaykh, Shibin el Kom, Siwah, Sudr, Suez, Suhaj, Tanta, Zagazig and Zifta. Bahr el Nil (Nile River), Buheirat al Manzala, Buheirat el Burullus, Eastern Desert, Foul Bay, Great Bitter Lake, Gulf of Aqaba, Gulf of Suez, ibyan Plateau (Ad Diffah), Khalig el Arab, Khalig el Salum, Lake Nasser, Libyan Desert, Mediterranean Sea, Munkhafad el Qattara (Qattara Depression), Red Sea and Western Desert. Egypt's metal resources include iron ore, manganese, lead and zinc. The mineral resources include talc, gypsum and asbestos. Some of the country's commercial resources are petroleum, natural gas, phosphates and limestone. Egypt has frequent earthquakes, flash floods and landslides. Other natural hazards include dust storms, sandstorms, periodic droughts, and hot, driving windstorms called khamsin, which occur in the spring. Egypt has numerous environmental issues. This country's agricultural land is being lost to urbanization, windblown sands and desertification. There is also increasing soil salination below the Aswan High Dam. Egypt has water pollution from agricultural pesticides, raw sewage, and industrial effluents. Oil pollution is threatening the coral reefs, beaches, and marine habitats. The country has very limited natural fresh water resources away from the Nile, which is its only perennial water source. In addition, Egypt has had a rapid growth in population, which is overstraining the Nile and their natural resources.